30 Minute Thai Peanut Noodles are a bowl of nutty goodness. 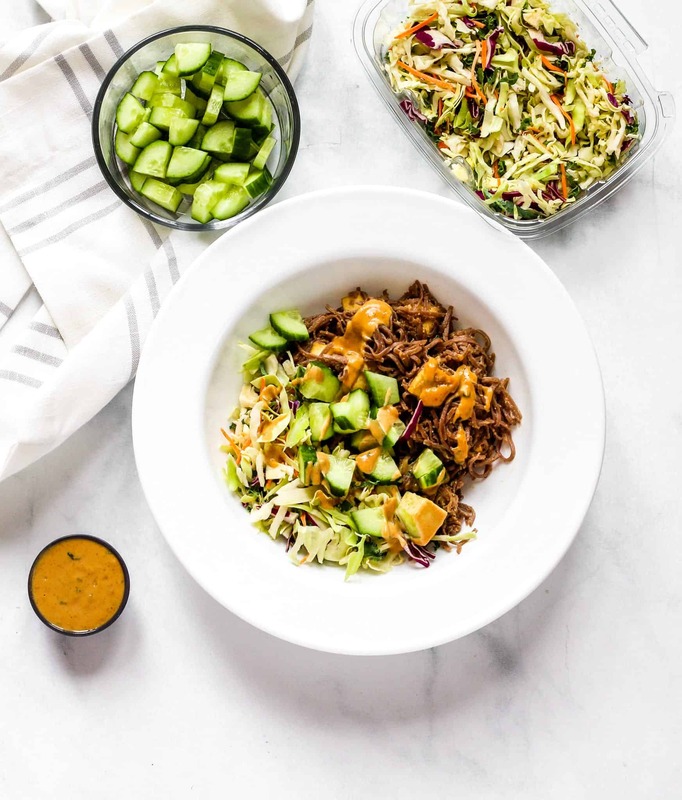 Served with fresh, crisp cucumbers and slaw mix and tofu for plant-based protein, this recipe is flavorful, satisfying and energizing! Pin 30 Minute Thai Peanut Noodles Here! It’s official – spring is here in Indiana! 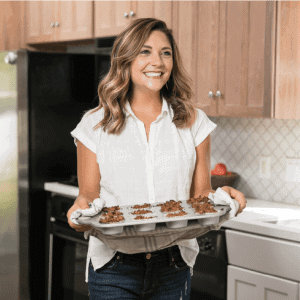 The weather has hit 50+ degrees more than one day in a row, we can expect rain showers most days (not my fav, but April Showers bring May Flowers…), and I am CRAVING fresh and crisp food and flavors. Is it warming up near you? When it comes to food and eating with the seasons, I feel like if I really listen to the foods my body craves it kind of happens naturally. 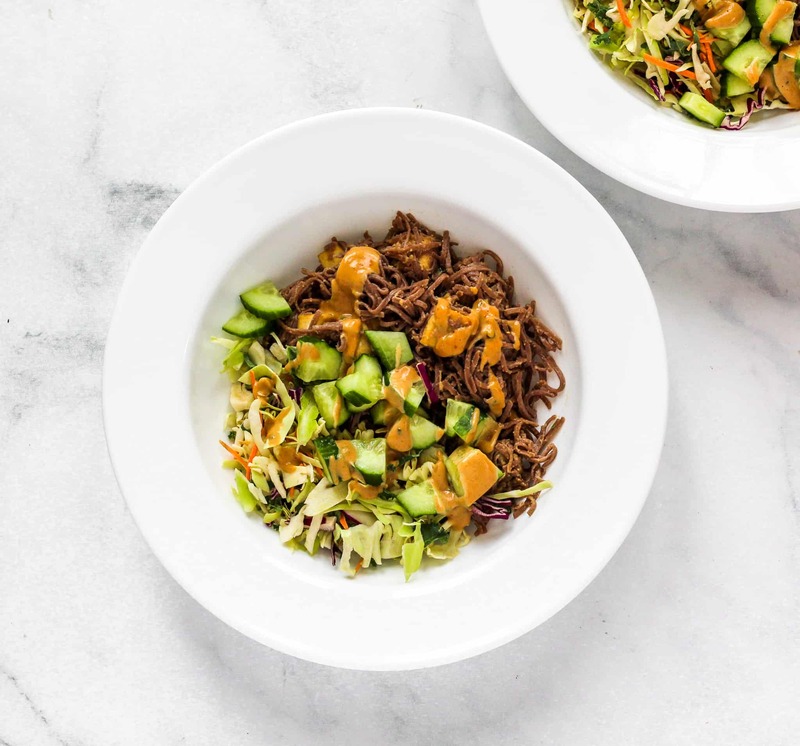 At the start of fall, I CRAVE a comforting bowl of chili , when summer starts I want all.the.berries (this salad is GREAT for pairing sweet berries with savory greens), and right now I am craving more fresh, crisp vegetables rather than steamed or roasted. Insert 30 Minute Thai Peanut Noodles. 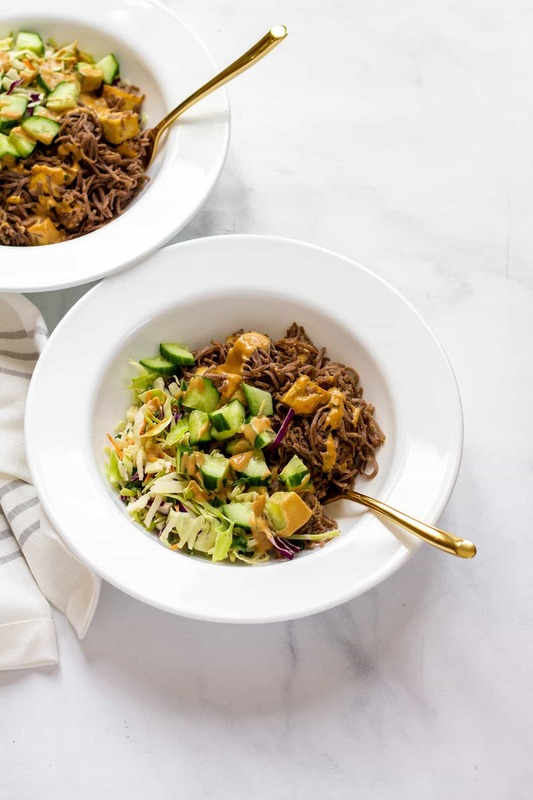 I was recently introduced to soba noodles, which are a noodle made from buckwheat that is naturally gluten free (and low FODMAP). The noodles are soft, slightly nutty in flavor and cook in literally 3 minutes. It’s been a while since I made my Thai Peanut Everything Sauce, but with this recipe it makes a comeback. 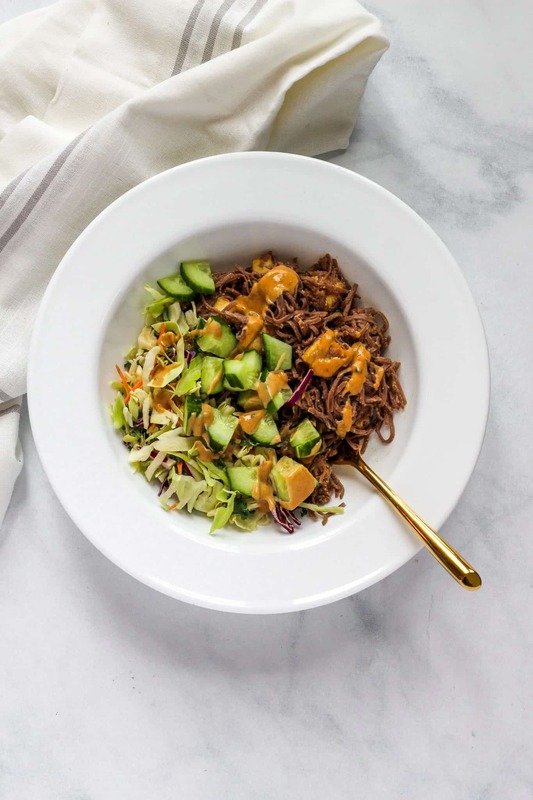 I call it “everything sauce” because it’s great to drizzle on bowls like 30 Minute Thai Peanut Noodles, tastes wonderful with Summer Rolls, is good for dipping fresh veggies…or anything else you think of! 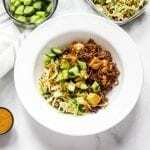 The most time consuming part of this recipe is going to be preparing the tofu, but you can absolutely do all of that ahead of time on the weekend or at the start of the week as a little meal prep to make putting this bowl together easier and quicker. I suggest using firm or super firm organic tofu (you can find this in most grocery stores near the produce section). To prepare the tofu, preheat the oven to 400 degrees. While the oven is preheating, you will need to press the tofu. You can absolutely purchase a tofu press, but personally I have a DIY method where I wrap the tofu in a clean paper towel, place it between two plates and put something heavy on the top plate (canned goods or cookbooks work well!). Allow it to set and drain for 10-30 minutes (depending on how much time you have), then cut the tofu into bite-sized pieces. Line a rimmed baking sheet with parchment paper and place the tofu in a single layer on the baking sheet. Spritz the tofu with olive oil cooking spray and toss to coat. Bake the tofu for 15 minutes, remove it from the oven and give it a stir then cook for another 15 minutes. The end result will be crispy tofu that can take on any flavor you want! It’s ready for this recipe. While I’m not a vegetarian or vegan, I do support eating a variety of foods, LOTS of plant foods and being considerate of the quality of animal foods we consume as well as how much. Monday, April 22 is Earth Day so I feel like the topic of helping our environment is fresh on my mind and has me being a little more conscious about the amount of waste I produce and thinking about the changes I can make to help our planet. If you are allergic to peanuts, you can try 30 Minute Thai Peanut Noodles with sunbutter, almond butter, or even tahini. They would all work great in this recipe. This recipe is naturally gluten free. All ingredients in this recipe are used in low FODMAP amounts according to the Monash University App. Make the Thai Peanut Everything Sauce. Whisk together peanut butter, tamari, vinegar, lime juice, water, sesame oil, chives, and crushed red pepper until smooth. Set aside. Make the Tofu. Preheat the oven to 400 degrees Fahrenheit. Place the drained and diced tofu on a rimmed baking sheet in a single layer and spritz with olive oil or avocado oil (I put olive oil in a misto so it is easy to spray). Bake at 400 degrees for 15 minutes. Remove from the oven and stir/flip the tofu then bake for another 15 minutes or until golden brown and crisp on the outside. Cook soba noodles according to package instructions, then drain and rinse under cold water to stop the cooking process. Return back to pan they were cooked in. Add the tofu to the noodles in the pan and toss with half the peanut sauce. 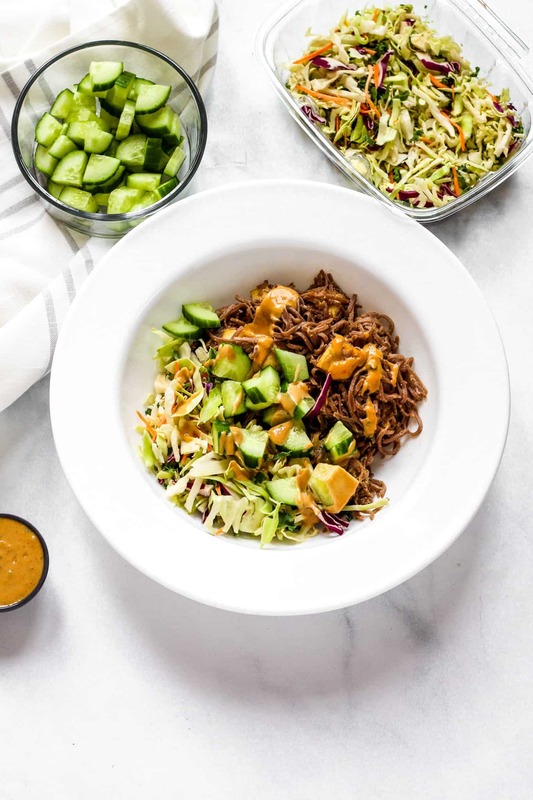 Divide noodles and tofu between four bowls, then top with cucumber, slaw mix and drizzle with remaining sauce. Serve right away or store in a sealable container and serve later, cold. Feel free to sub sunflower seed butter, almond butter, or tahini in place of the peanut butter as necessary. All ingredients are used in low FODMAP amounts according to the Monash University app, but this recipe has not been tested for FODMAPs. This looks delicious! Can’t wait to give this recipe a try! Thanks, Kara! Would love to know what you think if you do!